It is the second decade of the nineteenth century in the rapidly expanding industrial town of Nottingham. The emerging hosiery industry is the only means of livelihood for hundreds of refugees from the surrounding agricultural villages who have fled to the town in search of a less hazardous way of life. They are herded into hastily built slums, and grudgingly paid subsistence wages for a skilled product which is funding several private fortunes among the more wealthy entrepreneurs. But the terms of international trade, blighted by the Napoleonic Wars, render the hosiery product hard to sell in Europe, whilst at the same time forcing domestic food prices ever upward. Starvation and disease are rife in the festering courtyards of the resentful workers, who are desperate for a champion to their cause. 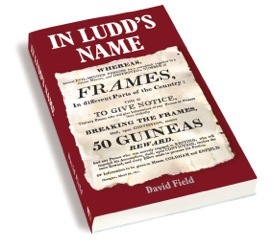 Then into this tinderbox someone throws a lighted fuse called Ned Ludd . . .